There are a few catalog cigars that have become staples in my humidor. When I see them at a good price, I snap them up because I always need good everyday smokes. Among those are the Gran Habano No. 5 and the 3 SLS (formerly 3 Siglos.) There is an earthy character to a lot of Gran Habano cigars — the SLS in particular — that appeals to me in a certain mood, when the weather is cool and I want to wallow in the terroir. So when some samples from GH appeared unexpectedly in my mailbox a couple months ago I was not displeased. First, my favorite of the lot: the Gran Habano Corojo No. 5 Maduro 2011. Made in Honduras with a Corojo Maduro wrapper from Nicaragua, an Habano binder, and filler from Costa Rica and Nicaragua’s Jalapa valley, the company calls this cigar “the strongest blend in the Gran Habano profile.” I did not find this 6 x 54 Gran Rubusto to be overly strong, but it was well built and quite tasty. It is rough in appearance and the cap is a little slipshod, but that’s the nature of maduro leaf. More importantly, the draw is excellent and it burns like it has all day. The flavors are initially a bit outside the standard maduro spectrum: piney with a syrupy sweetness. After an inch the more conventional cocoa/coffee flavors kick in, and then that trademark Gran Habano earth appears on the palate. It’s a nice balance of flavors with more complexity than your average maduro cigar. The rich pine taste in the first inch is a great complement to the traditional maduro flavors. The Gran Habano Gran Reserva No. 5 appears to have the same internal anatomy as the Corojo No. 5 Maduro, with a natural corojo wrapper swapped out for the maduro. Beneath the cedar sheath, the wrapper is in fact only slightly lighter than the one on the Maduro blend, but the flavor is quite different. Unfortunately this particular sample seemed to be either underfilled or rolled too loosely, resulting in a hot and airy draw. The flavors are similar to the No. 5 that I’m familiar with, but a little more complex. 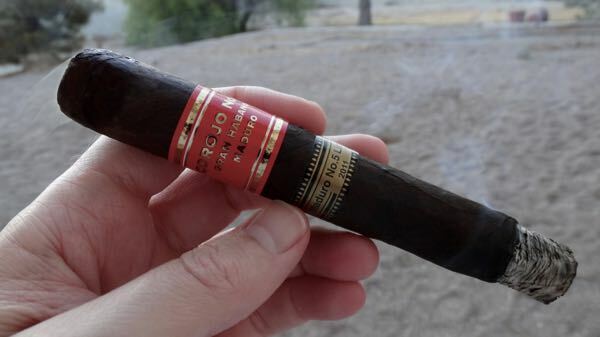 The earthy, slightly musty flavor appears in the middle of the cigar, but before that is an interesting prelude of licorice and cherry, followed by a sweet barbecue char. It’s a meaty cigar, and assuming that the construction flaw is simply a fluke I’ll be picking this one up as a nice companion by the grill. Of the four sticks in this sampler the George Rico S.T.K. Miami Zulu Zulu Mas Paz Edition wins in two categories: longest name and most unique packaging. The Zulu Zulu arrives in a decorated paper sheath that veils the cigar from top to bottom. This touch of the artist comes courtesy Rico’s friend, “Mas Paz,” who also contributed the box art. The cigar itself is made in Miami at the G.R. Tabacaleras factory and comes in either an Ecuadorian Connecticut or a Nicaraguan Habano wrapper. Based on taste and appearance I’m going to guess this was the Ecuadorian CT. 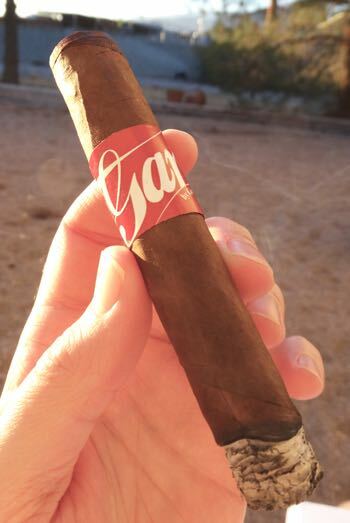 The last contender is from Gran Habano’s econo line: G.A.R. Red by George Rico. It’s a smooth cigar, though this sample was slightly marred by a loose draw. The flavor is mild and grassy and the aroma is light, sweet, and woody. It burned a bit hot, but for a bargain/bundle smoke it’s not bad at all. Gran Habano’s Corojo No. 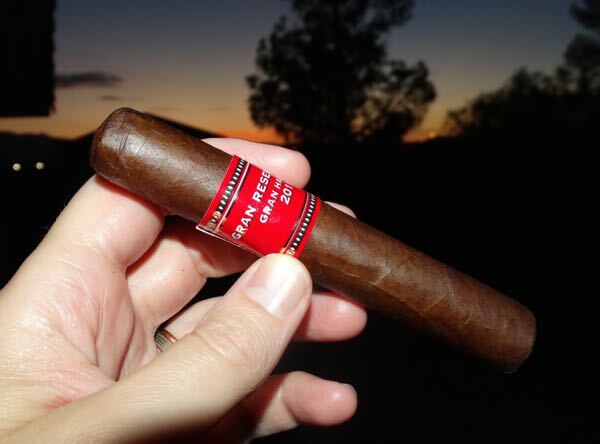 5 Maduro 2011 is an exceptional maduro, and the S.T.K. Miami Zulu Zulu is just a sweetheart of a cigar. If you put both in front of me and made me choose, it wouldn’t be an easy decision, but I’d probably fall for the No. 5 2011 Maduro. Botching the cut – my specialty! 😉 Gran Habano’s core line #5 is a terrific budget smoke that I for some reason don’t smoke enough of, but the 3 Siglos didn’t make much of an impression on me. I just smoked my last Zulu Zulu habano lancero. They took a while to get to an ideal state, but once they did, they were very good. I’m also a fan of the STK Opium, which is a great medium stick, and have enjoyed the Gran Reserva #3 2008, GAR white label, core line Connecticut #1, and Azteca. All of which is to say that although I have enjoyed a number of Gran Habanos, I haven’t had any of the cigars in this review. I will have to rectify that. Great work! It sounds like both us need to attend a remedial cigar cutting class. But what could be more fun than cutting class? Haha, I’m all for perfected imperfection. Regardless of that, I may have to start working on a laser guided cigar cutting mechanism. Think I could partner up with DeWalt and sucker enough people into making me rich? *Just a joke, of course – DeWalt makes great power tools. Maybe Ryobi? Brilliant idea. If folks will buy a hundred dollar lighter, a laser guided cutter can’t be out of reach. The cutter of choice for fans of the Gurkha HMR Reserve! I’ll test drive it on some of these La Fincas first though.